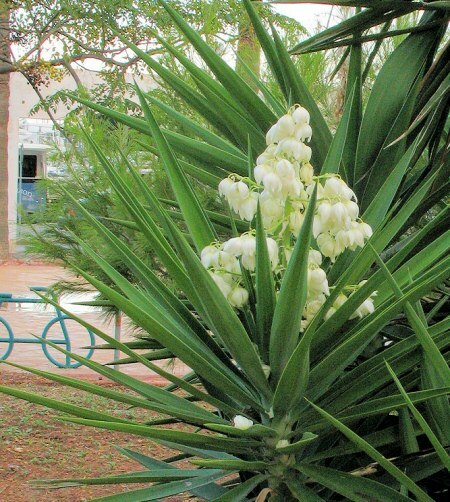 ﻿ Yucca gloriosa (Spanish Dagger) : MaltaWildPlants.com - the online Flora of the Maltese Islands. Published in Sp. Pl. 319 (1753). Naturalized on sand-dunes and waste ground, also in very disturbed rocky or littoral areas. Shrub; stem 50-120(-200) cm, usually branched in older plants. Leaves 50-100 × 5-8 cm, very rigid and with strong, pungent apex, dark green, with reddish-brown margins which are remotely denticulate in young leaves but usually entire at maturity. Peduncle 50-100 cm, with several bract-like leaves. Panicle 100-150 cm; branches patent to ascending. Flowers white, usually tinged with purplish-red; perianth-segments 40-60 mm. Fruit dry but indehiscent, with 6 prominent ribs.